"Onigiri or should I say "Riceball Paradise" should be in the favorites list for every Fruits Basket fan. The way the site so accurately keeps with the tone and spirit of the show almost makes me swear that Tohru Honda is the one running this website. The first thing that grabbed my attention was the colors of the pages -- They're all pink and rightfully so since that's also an anime homage. At first glance the site seems rather small, but that's until you actually click on the links. The characters link goes straight to a page with tons of character links that all go to full character dossiers with a ton of episode screen captures. I'll let you look at the omake section for yourself it's awesome." "Man, I love Fruits Basket. It's just a terrific series, and any good series deserves an awesome fansite like this one. Bios and/or images of just about every character in the series, extensive information, and it's all told from Tohru's point of view! Not only did the webmistress put a lot of thought into her layout and design, but also in her presentation... and that gets extra marks in my book. Kudos to Riceball Paradise! "Onigri - Riceball Paradise is not to be taken lightly. Sporting a disclaimer which states "for optimal enjoyment: ... a strong tolerance for PINK", this Fruits Basket fan site is indeed a heavyweight in the super-happy-pink category. Content-wise, the site sports extremely in-depth episode summaries and bios for all the characters. If your Fruits Basket craving still isn't satiated, Onigri also offers wallpaper, song lyrics, and enough other miscellany to drown a seahorse in. 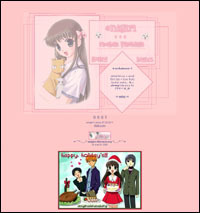 I highly recommend this site to all Fruits Basket fans!" "Wow! Lots and lots and LOTS of pictures of cute anime girls with big eyes and short skirts. This is a site that is driven by its images. Great images are used everywhere and to good effect. Being a visual person, this really grabs me. All of the pics are great looking and very high quality. Perhaps a bit TOO high quality... The site design is very weighty and takes a long time to load. Perhaps some skillful image compression would make navigating this site a swifter and even more enjoyable experience! Great work. ^_^"